One of the contradictions of urban riding is that old fashioned cities usually accommodate bicycle riding, while the newest suburbs, less dense, are frequently the most dangerous places. In Chicago, however, if you stay close to the lake, both the city and the forty miles of suburbs north of Chicago are laid out in a way that seem to promote safe and enjoyable bicycling. I had left downtown Chicago about 1:00 PM. I circled through the various stages of Chicago; first the towers of the Loop, then row houses of northside neighborhoods, then miles and miles of close together houses on city streets. While all this was pleasant cycling, after two to three hours and still in the Chicago city limits, I was tired. I had gotten up early that morning to catch the flight from Raleigh/Durham, it had been a long week at work, and it was all catching up to me. About 4:00 PM in the northern fringes of the city limits I stopped in a bar for a brew. One tasty craft ale was all I really needed; I felt newly invigorated. I rode off, ready for new sights and challenges. I rode for another three hours. As I headed into the near-Lake suburbs, the scenery changed. This was now all single family houses, usually large ones. Biking in these affluent suburbs was generally stress free. I followed Sheridan Road for miles. It was like riding on a residential street that kept going. All the while the political boundaries kept changing, suburb to suburb. Some areas identified themselves as villages. 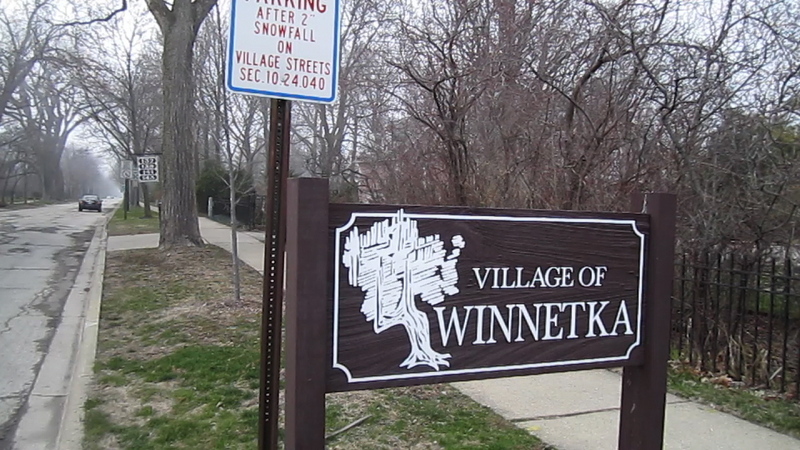 Directly across the street from this sign welcoming us to Winnetka is this typical village abode. The inhabitants lived in houses of at least five thousand square feet; many had lawn decorations. Some had fences around them. These houses were huge. I looked for the inhabitants of these villages. The only people visible were pudgy fifty something guys on multi thousand dollar bikes and fifty something women jogging. 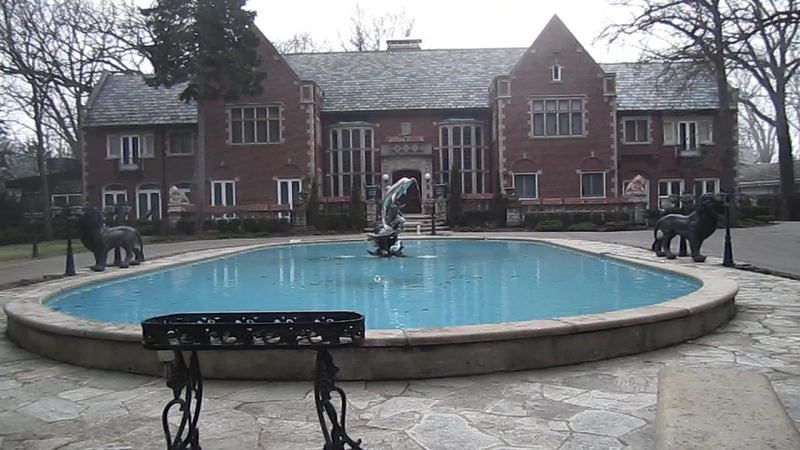 This affluent scene along the lake goes on and on. After considerably more riding, it was about 7:00 PM and I had no idea where I was going to stay that night. While I like to be picky about the quality of the food I eat, I am not picky at all about hotel quality. Location, however, is important on a bicycle. Bicycling back to a freeway motel at night on a dark highway after dinner and drinks can be dicey. It is rare in America to find a quality restaurant, bar, and small hotel in the same building, in a bikeable setting. Dare I say “European style?” Anyway, the Deer Path Inn in the town of Lake Forest, while maybe a little pretentious, fills the bill. This is a railroad suburb. Across the street from the Inn, you can take the commuter train forty miles to downtown Chicago. It looks like the type of of small downtown that fits everyone’s memory of what a small town should look like, except that the houses that surround the downtown are mostly estates with fences around them. The bar scene at the Deer Path Inn was lively. Apparently, everyone wants to eat in the bar and not the restaurant. I sat at the bar, surrounded by people standing waiting for a table. The menu looked like something out of a country club, circa 1962. The menu had everything; steak, seafood, hamburgers, sandwiches, and salads. There were so many choices I did not know where to start. The bartender recommended the lamb chops; it was a good choice. The walls were dark wood, with pictures of hunting dogs with game birds in their mouths. The whole place felt very Republican.